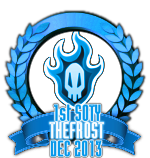 » Titles: Mage of Doom, Haxorpro, 2martguy, etc. Sollux is well… an interesting kind of guy. For one thing, he's freaking tall. Leveling out at over six foot, Sollux is closer to being a tree or some kind of troll than he is to being a normal person. However, he maintains a pretty lean body build for such height; due to the fact that he doesn't get out very much. He has a small amount of fat on his body, but not much. His face is an oddity right off the bat. With hair that comes out and yet refuses to go past his eyes, it instead curls up in front o fhis face in long strands, going down on the edges of his face and the back of his head. His ears are relatively normal; same for his mouth and nose. However, his eyes are a different story; they have no pupils, first off. They are pure scelera. Second, his scelera are not even the same color. One is red, and the other is blue; they will often even flip flop between colors, just never be matching in both eyes. He has an average sized neck, and then you arrive to his clothing. He wears a black T-shirt with the symbol of gemini on it; on top of this he wears a lemon yellow windbreaker. The windbreaker has a collar and sleeves that go almost to his elbow, before poking out white sleves that still don't quite reach the middle of his arms. Around each wrist and forearm he wears bandage wraps, and on each hand he wears a fingerless glove. His pants are black in color, and he wears different colored shoes, one white and one black. Interesting fact; ever since he was hit by the meteor, he bleeds a strange yellowish color. In addition, whenever he starts using his energy his skin begins to turn grayish, and small nubs of yellow horns grow out the sides of his head, two on each side. BiFractural: In Sollux there is little room for anything to be constant. He is indecisive, will go back on his word, without even meaning to, will be elaborate and grandiose at one minute and mopy and self-pitying the next. He has an SPD; split personality disorder. While he lacks multiple personalities, he'll randomly switch how his attitude is towards others. He will constantly beat himself up on his mistakes, even if he seems strong on the outside. In addition, when it comes to things like chance or tricking him, things only work about 50% of the time. He also has a bad habit of being a show-off, and then sorely regretting what he has done. Gemini: Sollux is a gemini. He greatly believes in his astral sign and what it means, knowing that he is two in almost anything he does. He does the work of two people whenever set to it; he fights twice as hard, he'll take twice as much damage before he quits. That is what it means to Sollux to be a gemini, and he is happy whenever he is made to use it, shown in his lisp whenever he has to communicate via text by putting double ii's to represent his lisp and 2's in the place of s's. Temper: Sollux can have a little bit of a temper. He always fights for what he believes in, as well as for his friends. If his friends are in danger, he'll give his life for their pride or to defend them. However, it takes very little to enrage him; pushing at one of his weak spots will cause him to loose his power then and there. Nano Mind Honey: Sollux uses nano bots to accelerate his computers and their thought processes. 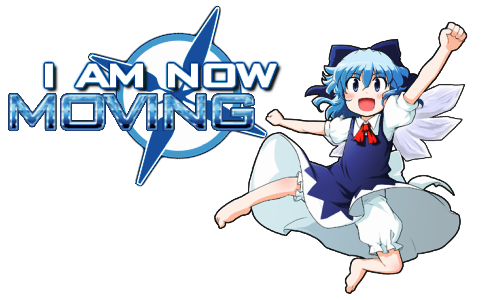 However, his nano's will use the things they take out of his processes to make them faster and turn them into a honey. This honey the nano bots make is green in color. Sollux does NOT eat the mind honey. Whenever he does, it overloads his psionic powers and he explodes, blowing away everything twenty feet around himself with a huge amount of power. He himself is unharmed by the blast, but that says nothing for things that were in the way of his attack. Glasses: Sollux takes great pride in his glasses. Any time that they are insulted are harmed, he turns into a rage, loosing as much power as he can. His glasses are totally unique, unlike any others in the world; they stick to his face via his psionic abilities. That means that if he doesn't have any power, he can't wear his glasses, which greatly saddens him. » Dislikes: Explaining things to stupid people. Sollux was born on the streets. His mother had a… not so viable profession. To say the least, she couldn't get any kind of legal protection. However, she died one day of a disease, leaving her young son to fend for himself on the streets. He had no father that he knew of; for all he knew he could have had multiple fathers. Her son had a penchant for computers; his mother wanted him to grow up to be a genius when he grew up, and his toys were dismantled calculators and bits and pieces of computers. However, he still lost his method of support, and was afterwards taken in by the state into an orphanage. He rather hated the orphanage; the kids there always would break his glasses and make him constantly have a band of tape around them, very cracked. His only interesting skill was his ability with computers; but there never came a chance for him to use it. However, that soon changed. Still only five years old, a man came by with a laptop. His laptop stopped working, and he was discussing several of the children there when Sollux climbed up onto the table, examining the computer. He reached out a single hand, and with five clicks of the laptop's keyboard it powered on and started running a full system check that came back positive. 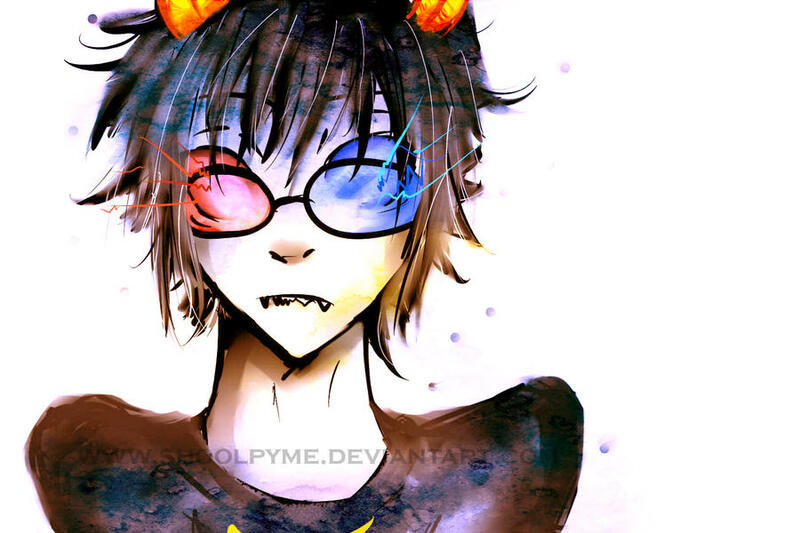 Little Sollux smiled as he clapped his hands, giggling. The man was stunned, as well as the caretaker of the orphanage. The man adopted him on the spot, taking him in for his talent. Soon, Sollux's glasses stopped being broken at all times. The man was a traveling businessman, longing for companionship, and Sollux was able to quickly fill that void. He didn't know his own name, so the man named him after the sign of which he believed that the baby was born. So it was that Sollux grew up. His adoptive father took him all over the world, and whenever he or his fellow digintaries had a computer problem, there was little Sollux right on the scene. Because he was so little he was allowed into the meetings, which most computer engineers were not able to do, giving him an edge on them. In addition, he became his father's greatest asset. He loved his adoptive father; the man who had finally gotten a whole computer of his own for Sollux. Or rather, a laptop for him. After all, the pair was constantly traveling, and therefore Sollux could merely craft the most powerful machine he could to use on-the-go. And Sollux woke up to the sight of his father's corpse hanging by a ceiling fan. It was the single most despairing moment of his existence. Stranded in a foreign country with no support, Sollux was found and subsequently kicked out by the hotel manager, who had been paid off by the men who had come and killed Sollux's father for accessing the computer that held the illegal operations of the company's gang relations, and the man took the money to treat Sollux like he was a street rat who had come in and murdered the American gentleman. The Americans tried to find the young boy who had gone to Baghdad with his father, but they never saw him again. Sollux was thrown out on the street, for the hotel manager had some mercy and did not want the thought of a young boy on his consciousness and giving him bad chi. So Sollux became out on the streets once again, but this time with his own computer. He discovered an internet café that would allow him to keep their machines up and running in exchange for a place to sleep. To prove his skill he was forced to wipe the entire store's database from a virus that had gotten into its system due to the store manager looking up so much p0rn in his free time. Not that Sollux knew what that was. All he knew was that there were a lot of pictures of people that reminded him of his long lost mother around the database, which he deleted as well because they gave him bad memories. He stayed in that café for a year before the meteor hit. The meteor was the size of a good sized building ,and slammed into the café. Sollux had been working the night shift, as usual, when it hit. Baghdad's police soon found him, unconscious, out cold. They rushed him to a hospital, but they never made it. In a searing flash of blue and red light, their car exploded on the road without warning. Sollux was the only survivor, stumbling out of the car with his eyes red and blue in scelera color, his pupils completely gone, and no idea what the hell had just happened. He stumbled around, before he stumbled fell down; not a bit of energy remaining in his body. When he woke up the next morning, it was the same. He got up, stumbled for a bit, and fell down again. There was no way for him to get anywhere. He didn't even understand how in the hell he was still alive as he got out his ipod QuasaGen. "Ii ju2t lo2t the abiiliity 2 walk. 2hiit." He posted, before falling unconscious once again. In his dreams he was completely disturbed, watching himself die twice. Once due to a massive explosion he didn't even understand; and somehow he died again, the amount of exertion he used to create a massive wave of red and blue killing him. He didn't understand; how could one person die twice? He somehow knew it was all true; but that was all he knew. He awoke once more, before realizing he was floating high in the sky, the clouds below him. At first he was terrified; then he began to realize that he was somehow controlling himself to float. He threw his gaze out over the clouds, as he saw his reflection returned to himself in one. He was shocked by what he saw; no longer did he look human. His skin was almost a grayish color, and tiny nubs of horns had sprouted from his head. Meanwhile, he saw his eyes. He had lost his irises; his glasses were gone, although he didn't know this was because he blew them off with the energy wave earlier. Instead, his eyes were now radiating, leaking power. Blue from one, red from the other. However, as he was looking he was overwhelmed by despair, for he had no clue what had happened to him; he didn't even know if this was his fault. As he lost his control on his emotion, his eyes began glowing brightly, before firing a gigantic wave of energy upwards as it pierced the cloud. Sollux couldn't believe how instantly he felt exhausted. He didn't know what was going on; but it was clear to him that he whatever it had given him was to be used sparsely. He began to experiment with the floating, before realizing this meant he could go anywhere in the world! He began joyously flying around, his eyes closed as he continued to look out over the ground below cloud level, looking for landmarks. Finally he found his way to the old internet café, seeing the meteor there. As he approached it, Sollux's body began to act odd. He got a massive headache, in addition to his heartbeat increasing immensely as he began to sweat. He didn't understand why this was, but would later. The meteor was made of a material that Sollux's latent anima stones had hated, which is what caused them to become unstable and begin to go into conflict with one another inside of him, woken up by the huge meteor which is why it was not able to kill Sollux. His body became powered just before he was hit by the red anima stone waking up, turning his body's resistance to supernatural and protecting him. His eyes narrowed as held up a hand, blinking as power began to emit light. The light began to emit around the meteor, as Sollux felt some kind of drainage full in his body as he threw his hand up in the air. The meteor followed his hand, as it flew up through the air, and Sollux looked up at it, his eyes sparking before releasing another massive beam of energy, completely destroying the meteor in the blast. Sollux could barely move anymore. He began to float up again, as he began nodding off once again. By the time he became conscious again, he was floating over the ocean. He had no idea where he was or what he was going to have to do, but he realized he finally had something interesting that he was able to do. He began to fly around the ocean, enjoying the feeling and releasing energy continuously and trying to get the feel for it. Roughly twenty years later and not bothering to keep track of the time, as his body remained exactly the same, Sollux created his own little place of sorts in the Mediterranean Isles, making it completely invisible to spiritual detection by the means of his advanced technology that he had assembled. In addition, he trained himself, learning practical applications for his abilities. 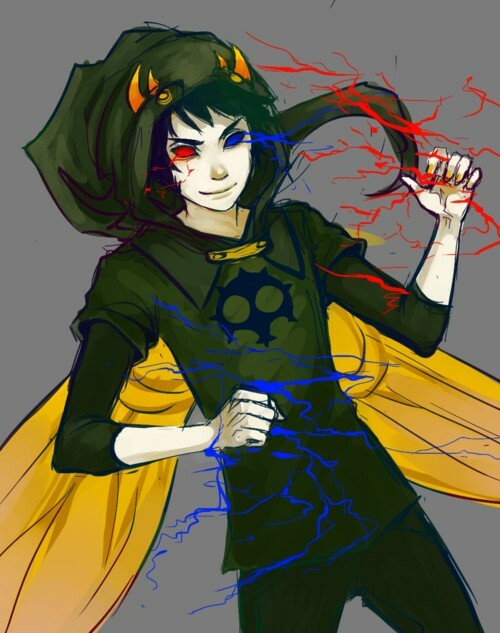 Computer Hacker: Sollux is extremely skilled at hacking computers, able to bypass entire military defense systems in a matter of mere moments, not to mention make codes onto a computer that when run, cause it to explode. He is extremely gifted with anything related to computers, with programming, with repairs, with graphics work; you name it and he can make it. He has even created a program before that allowed one to interact with the real world around the computer; he calls this Grubs Beta, and it allows him to pick things up in his environment from the computer instead of having to do it himself. In addition, he is even able to commune with nano bots, causing them to malfunction or even hijacking them and causing them to work for him with his mind power alone. Dual Soul Detection: Sollux's Soul Detection is interesting. Not only is very potent and very powerful of a soul detect, but it can also identify the moods of anyone giving off more then 10% of their released states. This allows him to percept the single greatest emotion from the being, his brain registering the mood as he detects their energy. This can be very helpful if he is being attacked by multitudes of people, or even assassinated; because as soon as he senses the other person's energy, he can tell their mood and weather they are trying to be helpful or sneaky or some other mood. His normal soul detect causes his eyes to light with his psionic energy, both red and blue. Dual Lasers: His eyes are able to emit an enormous amount of Sollux's power. At a max blast, Sollux's eyes are capable of producing a blast twice the size of a Cero Oscuras; although this is highly inadvised, as this leads to instant Blindness. However, he is able to use this much output on his eyes before they wear out; an example of his massive power well. Power Well: Sollux's body is able to hold an insane amount of energy due to his Anima Stones. He has not one, but two core Anima stones; one bright red and the other deep blue. The two forces are constantly battling one another and producing energy for Sollux, providing him with perhaps an unlimited amount of energy that he can use. However, he cannot use nearly all of it; he can only use as much as his body can handle. One of the deaths that he has predicted in the future for himself involves over-bearing on the energy to such a state that he kills himself, blood leaking from every orifice on his body and causing him to die. Blasts: Sollux's arms are able to take quite a high amount of the energy that the power well can provide, up to a Cero Oscuras in size before they begin to strain. However, they can also perform extremely complicated tasks with his energy, such as making a keyboard from his energy, or allowing him to perform telekinesis on several objects at once and constructing a model. Eyes of the Armageddon: Sollux's eyes have seen his death. Or rather, deaths. 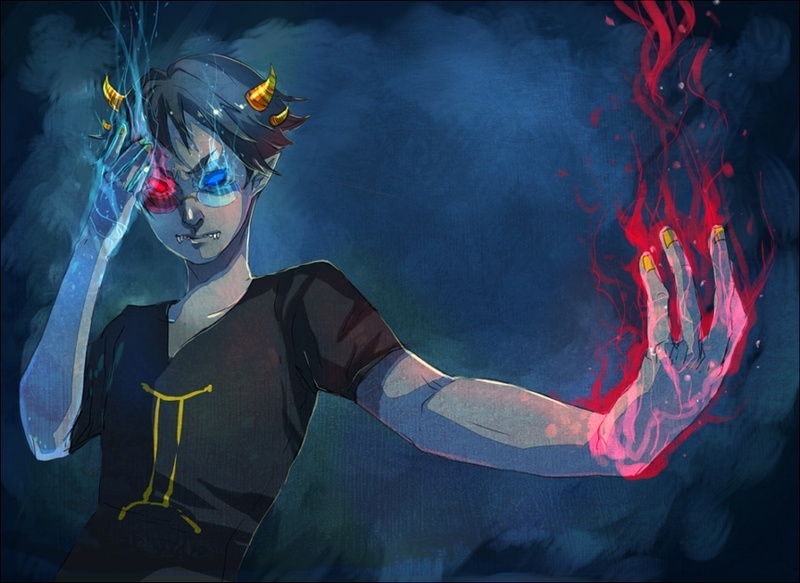 Sollux has three lives; his own life, the life of his red anima stone, and the life of his blue anima stone. When one of the stones dies, the eye that corresponds with it either goes black or white. If it is the red eye, it will go white. If it is the blue eye, it will go white. Similarly, the anima stones inside of him grow to match this. Inside of his body, the Anima stones have taken the place of his heart and his brain, the Red stone his heart and the Blue his mind. Blue Stone: The blue stone greatly increases his minds processing power, making it up to 200 times more complex and folded over than it would be otherwise. This means that he can completely several things, acting in the capacity of more than two people, with different thought processes all at once. This does not make him an ultimate sage and know all; but he is made extremely observant because of it and can perform many mentally demanding tasks at a time because of it. Red Stone: The red stone greatly increases the abilities of his body, allowing it to use the energy created by the conflicting energies of his blue and red eyes. Note that this merely increases what his body can handle; it allows him to take a high amount of energy damage, but he is susceptible to physical attacks, making him have to use the power this stone gives his limbs and body to dodge most of the time. This means that there are two ways to shut Sollux down. Either out speed him and cut him up, or else you have to merely cause him to overexert himself and make himself Blind or else overuse his power and nullify himself. In other words, making yourself insanely powerful for a moment and overloading Sollux is an efficient way to shut him down. Youtube: He has the divine control over youtube. He can make videos of whatever he desires to appear on there, from any user at all times. This is an interesting power of his, for it allows him to communicate ideas and concepts instantly through this video medium, and also communicate quickly with beings that cannot understand mental communications or are spiritually unaware. Or just cause massive memes to appear. Telepathy: Sollux is a telepath. He is able to float effortlessly with his power, causing light of blue and red to emit from his hands, corresponding to where the colors in his eyes are. He can lift objects with his telepathy as well, able to carry up to two buildings, one in each hand. However, he cannot move his legs physically when he is lifting something 100 times greater in weight then him. This means that while he can walk around chucking cars at things, he can't just pick up some houses and walk with them. In addition, he is able to compile up to one hundred different independent functions with the full power of his extremely powerful mind, augmented by the blue stone. Blasting Power: The energy that the conflict of the stones create can be used for telepathy, as well as for creating actual blasts. Either by firing solid lasers that burn and destroy from his eyes, or else forming energy into his hands before blasting it out. He is able to fire out quite a bit of an energy at a time, as he has had quite a while to master his craft, as well as having his body prepared by the red stone. He has overpowered arrancar's ceros with the blasting energy of his body before. However, he can only emit the energy in an offensive way from his hands and his eyes, and must direct the power with his hands to change its path. He cannot change the path of the blasts of his eyes, which are much stronger. Rave: Interestingly, Sollux is able to create an entire room into becoming like a rave room. This involves emitting his energy as light; he is able to manipulate the light through several mediums, through things like flashlights to make light sticks that create a glowing image, or just controlling the lights in an area and making it very rave. In addition, he can generate music from sound boards made of his anima stone energy, effectively making good music to a battle or starting a party, as after creation they must be attacked to die, as they are self suffecient through the reishi in the air. Explosive Energy: He can fire glowing blasts of red and blue energy that explode on contact with an enemy or when Sollux sends it a signal from his mind with his extremely fast thought process and energy from the anima stone, causing it to explode for up to a hundred foot radius around himself. Overall, be careful when encountering Sollux; although he can only fire one of these every post. When Sollux enters his Soul State one, he becomes quite strange looking. Four horns grow out of the sides of his head. His skin becomes extremely gray, and then his entire body comes aglow with red and blue. Finally, he splits in half, as his karmas split away from him. One of the karmas is bright yellow in color of clothing, the other a light purple. 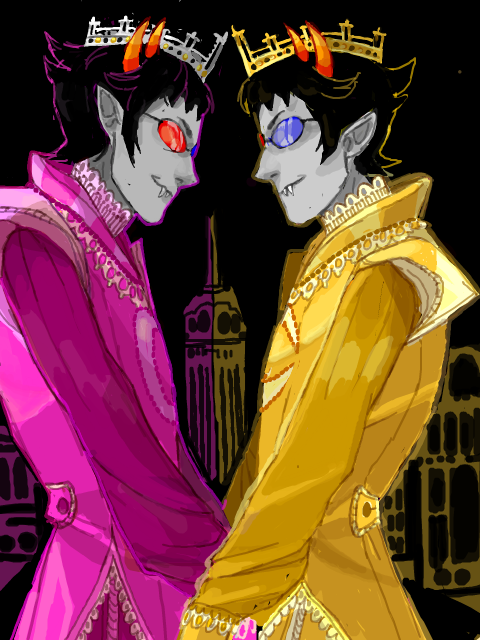 However, they both have the same eyes and otherwise appearance of Sollux Gemini. It takes three posts of charging the anima stones to activate this form. Dual Split: Sollux's body remains otherwise the same, however each side of him has one of each of his anima stones, meaning it has all their power as well, due to the fact that he advances to this state by storing up a huge amount of energy from his stones and then releasing it to create two new ones in another body that is himself. However, this comes at a price. The yellow Sollux cannot do anything whatsoever that would initiate bad karma; whereas the purple Sollux cannot do anything that would initiate good karma. That means that if one of them is unable to do something, they can complete the task as long as they have both of them there. HOwever, if they are neutral... WATCH THE HELL OUT. These two have been known to create giant sandpits while training before, although they never agree on anything. To trigger his Soul State Two, Ascended State, the two Sollux's must combine together after three posts of charging up, fusing their unstable anima stones as the power of two anima stones plus two animas, each anima stone storing enough for another anima stone, before Sollux's body is run by 8 independent anima stones, four red around where his heart should be and four blue inside his skull in the shape of his mind. Oh yeah. He gains wings; in addition, his clothing changes to a dark forest green color, becoming a whispy cloak shirt and pants that wraps around him and a cowl that flows back behind his head. In addition, he can no longer wear his glasses; the amount of power being emitted from his eyes is enough to blow them away just wearing them. Ascended State: The key to Sollux's Mage of Doom state is the essence of Eightfold. His energy output of each part of his body increases its potential by eight times; his eyes can fire truly unholy blasts that can level blocks of buildings and his hands large bombs that consume the area they hit. His speed rises by eight times with his wings, causing him to dart around unmanaged, although he'll often bump into things the first three posts after activation. In addition, the amount of thought processes he can handle increases by eight times, as well as how much he can manage. However, three posts of Soul State 1 must be given to charge the stones before he can enter Ascended State, and after three posts within it he goes to Blinded state. The light in Sollux's eyes go out as his stones deactivate, and he begins bleeding from several orifices of his body if he attempts to use any more energy. 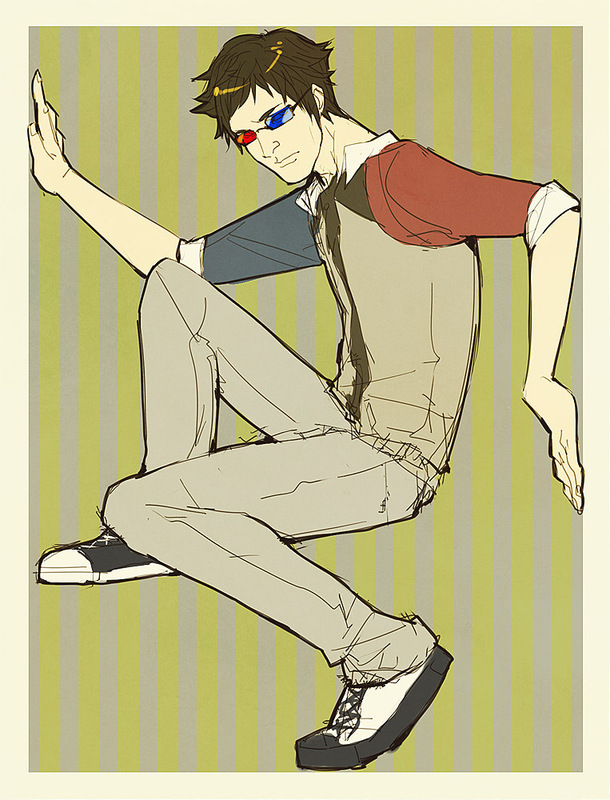 Blind: For three posts after overworking himself and blinding himself, Sollux becomes extremely weak and fragile. His bodily defenses drop to that of a normal human, and he will physically hurt himself if he attempts to exert power. Even the energy to, say, move a meteorite with him standing on it at this point would cause him to over-exert and die. 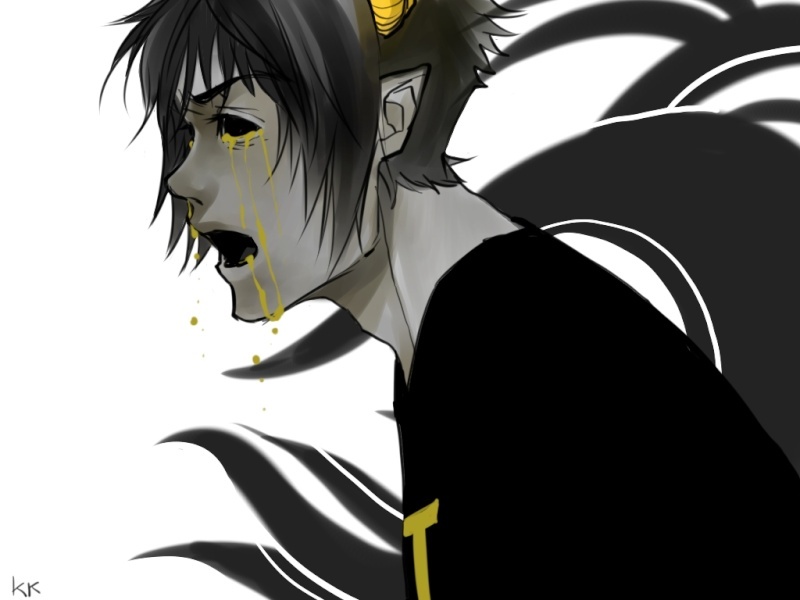 Which is why he has to be extremely careful while in this state; one wrong move and it's bye-bye, Sollux. In addition, this is where his bipolarness hits its peak, as he becomes a shell of his normal self, his personality becoming much less bright than it normally is and despairing and worrying. Comments/Notes: Interesting Concept.. I don't see any issues with it.